The nation pauses the third Monday of each January to celebrate the nation’s most prophetic civil rights leader and activist. But do we celebrate only a part of Dr. Martin Luther King's legacy? "God is not a Christian or a Muslim. God is not a Democrat or a Republican," said Dr. Lewis Baldwin, a King scholar who participated in the civil rights movement of the 1960s in his home state of Alabama. "There is nothing wrong with remembering and celebrating a dreamer, but what are we going to do to realize the dream?" Dr. Baldwin, a religion professor at Vanderbilt University, spoke Jan. 17 to Wabash students, faculty and staff in Salter Hall. Throughout the course of his 30-minute presentation Baldwin said America tends to celebrate the King they remember from the "I Have a Dream" speech of 1963 and not the King who spent most of his time before being assassinated in 1968 discussing social and economic injustices. Baldwin emphasized that King came to understand those social and economic injustices affected blacks, whites, and Latinos. "I think people are more fearful of that King because the people in power, that control the media, etc., want us to remember the King that talked about holding hands and rubbing shoulders and elbows," Baldwin said during a post-lecture reception. "But what about the King who called upon the rich and powerful and those who own the media, those who control politics, the purse strings of the economy … what about calling upon them to give up some of what they have? "I don’t think they want us to see that King. They don’t want us to see the King who was addressing foreign policy issues. They realize that kind of King is much more threatening to the status quo." Baldwin’s lecture and two-day campus visit was sponsored by the Wabash Religion and Speech Departments, the Multi-Cultural Concerns Committee, the Hadley Fund, and the Malcolm X Institute of Black Studies. 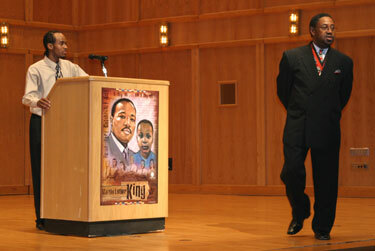 "What I liked is hearing Dr. Baldwin say is that you have to take King as a whole," said Malcolm X chairman Robert Alexander’05. "We seem to focus on one part or another but people change, people progress, and they evolve. Baldwin really illustrated how the King message has evolved. He brought an awareness to us how King pushed and that we have to have leadership that’s willing to fight to the death, that’s still needed." Alexander and other students questioned Dr. Baldwin for another 30 minutes following his lecture. A common theme in the questioning was the scholar’s advice to young people who want to make a difference. It’s a question that makes Baldwin uncomfortable. "I was in college and high school during the civil rights movement," Baldwin explained. "And what happened with us just happened. We didn’t have a lot of time to do a lot of thinking about what to do. The issues were there and we just responded. "When it comes to changing the structures of injustice, I think you have to take other approaches. We did it through sit-ins, freedom rides, protests, demonstrations, and acts of civil disobedience. But now a lot of scholars are saying ‘no, you can’t use the methods of the 60s to address contemporary problems because you’re talking about economic justice and international peace. That just won’t work.’"
During his presentation Baldwin said much of the 60’s protest was to remove racial barriers, taking down the signs segregating "colored people" from whites. The issues were clearly defined, like the integration of schools. Today’s problems are obviously more complicated. "You must be aware and must be willing to devote your time, energy and resources – even at the risk of life and limb – to pursue whatever ideal you have in mind. This is what Dr. King taught us, even the risk of life to achieve the beloved community ideal." In photo at top: Alexander listens while Baldwin responds to question. At lower right, Baldwin signs a copy of his book on Dr. Martin Luther King for student Aaron Miller '06.